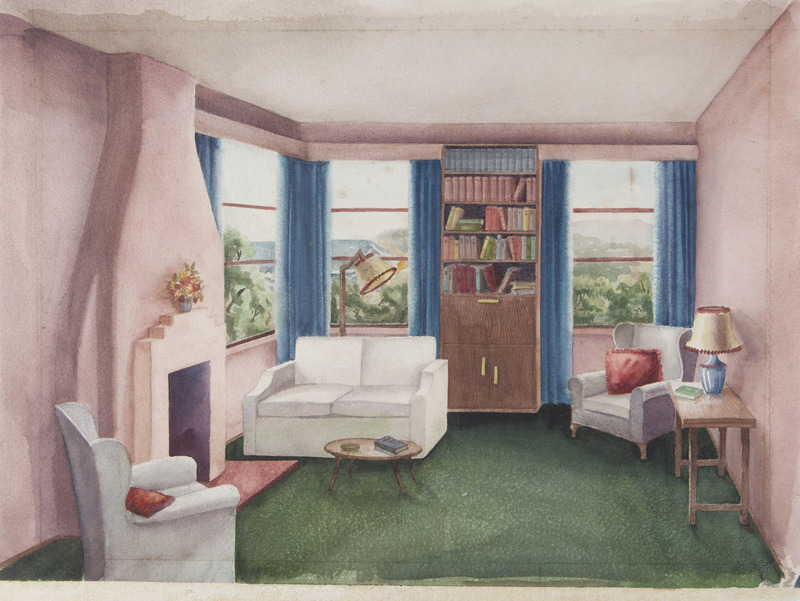 'Living room for "Herald" home': watercolour design by East Sydney Technical College student Helen Burgess, 1947. Caroline Simpson Library & Research Collection, Sydney Living Museums. Gift of Helen and Heather Burgess. 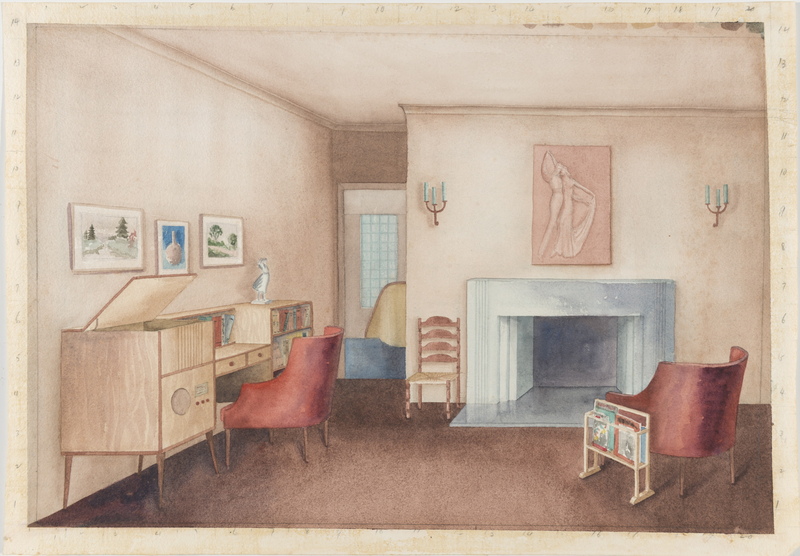 In early-20th-century Sydney, training for budding interior designers was limited to a few small private courses. 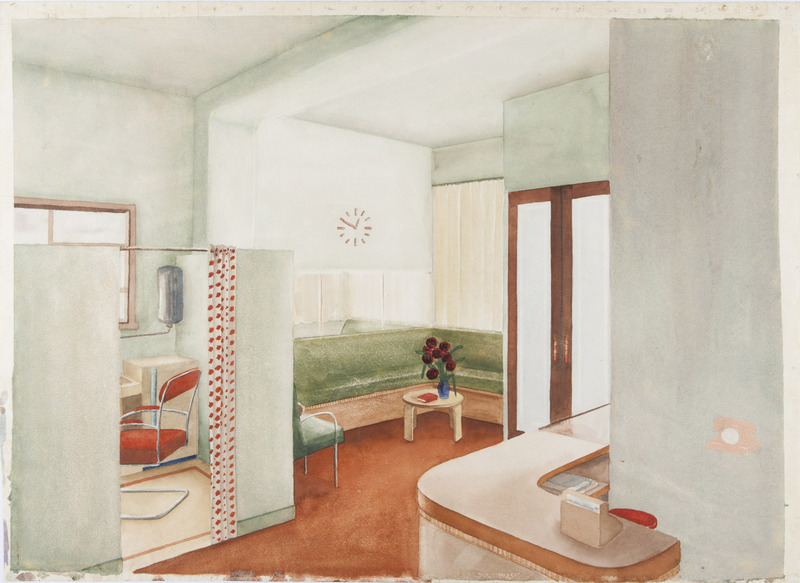 In 1938, Sydney Technical College at East Sydney began offering interior decoration classes under the guidance of Phyllis Shillito, Head of the School of Design. Helen Burgess (far right) with fellow students at East Sydney Technical College, mid 1940s. Caroline Simpson Library & Research Collection, Sydney Living Museums. Gift of Helen and Heather Burgess. 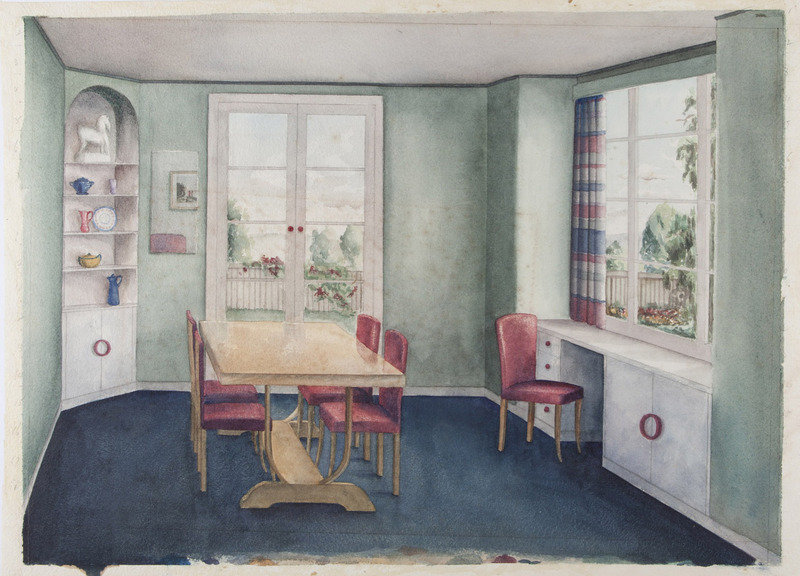 Helen Jean Burgess began a design and interior decoration course in 1943. 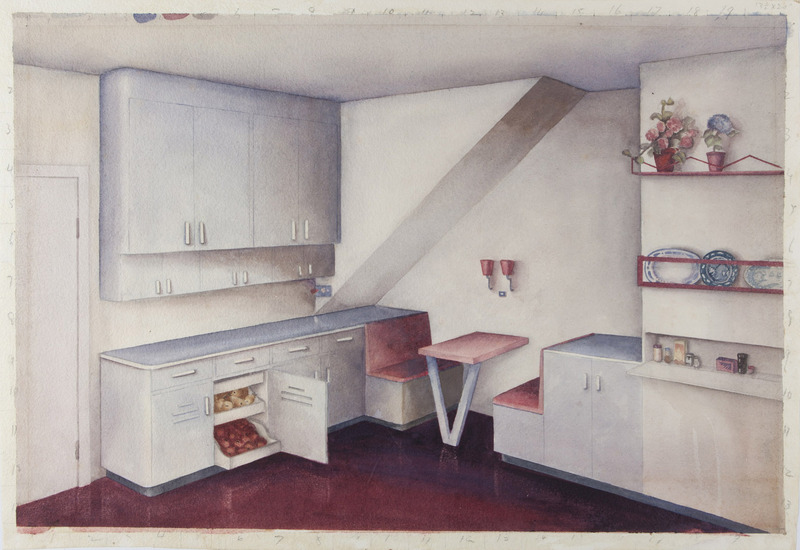 Her training included a series of assignments requiring her to render domestic and commercial interiors in watercolours. 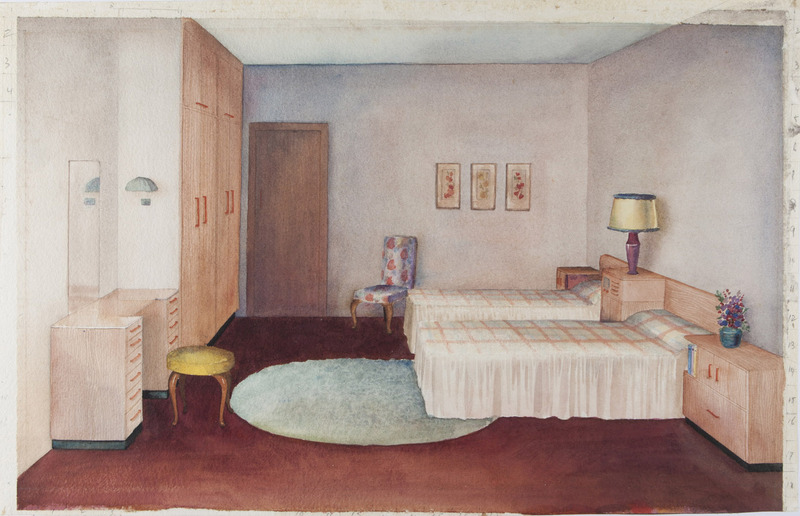 A typical project for students in the 1940s was to take an outdated room and turn it into a space more suited to new ideas in modern living. 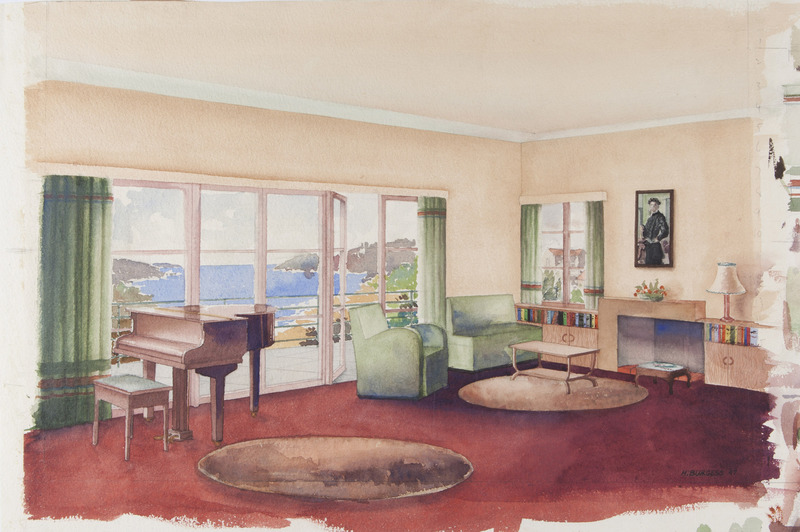 The Sydney Morning Herald sponsored a competition, ‘Herald homes’, in which students like Burgess produced low cost, functional designs to meet the challenges of post-World War II shortages of labour and materials. Another task long required of students at technical colleges and schools was to produce a realistic botanical drawing of a flower or plant and turn it into an applied surface design for a textile or wallpaper. Helen Burgess' final year work on display at the Education Department Galleries in Loftus Street, Sydney, December 1947. Photograph by Gordon Burgess. Caroline Simpson Library & Research Collection, Sydney Living Museums. Gift of Helen and Heather Burgess. In June 1948, Burgess graduated from the Department of Art at Sydney Technical College with a Credit in Design and Crafts. She never practised as an interior designer but taught design and various art and craft activities to children and adults for most of her life. 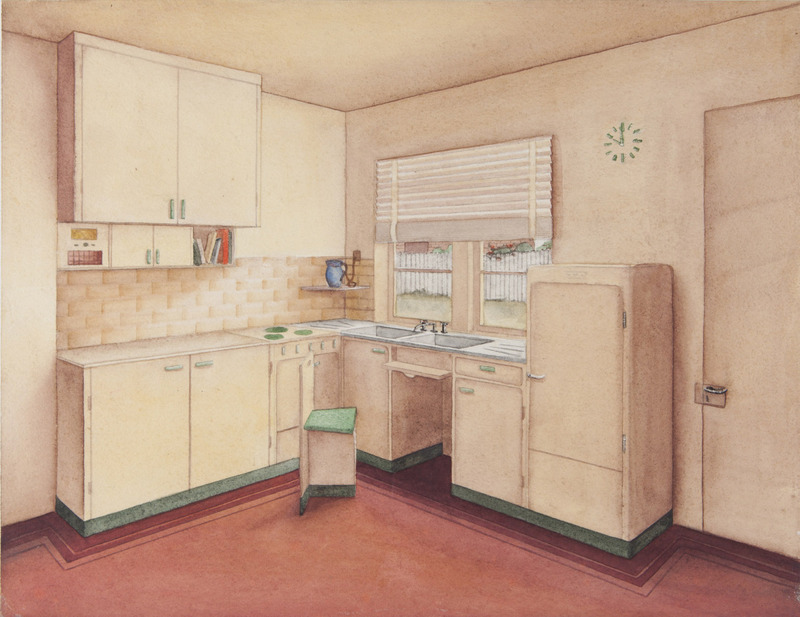 Watercolour design by East Sydney Technical College student Helen Burgess, 1947. Caroline Simpson Library & Research Collection, Sydney Living Museums. Gift of Helen and Heather Burgess. 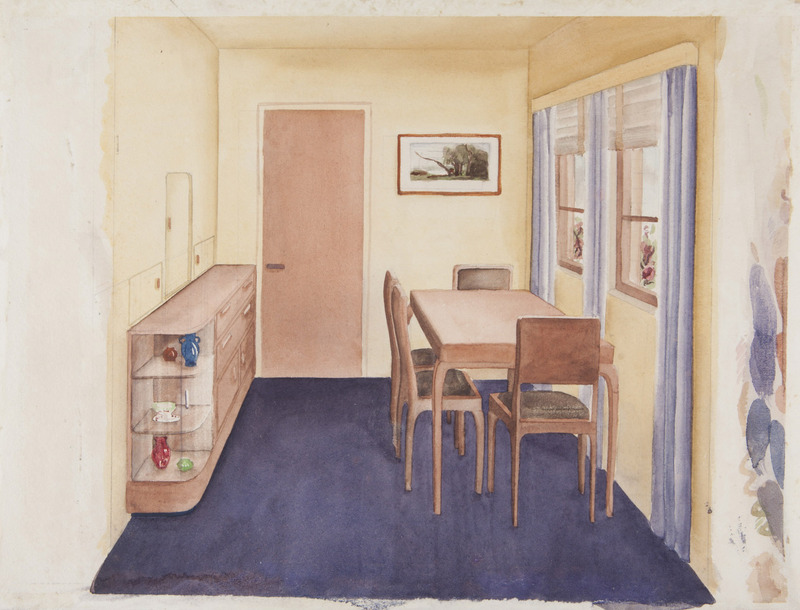 Watercolour design by East Sydney Technical College student Helen Burgess, November 1947. 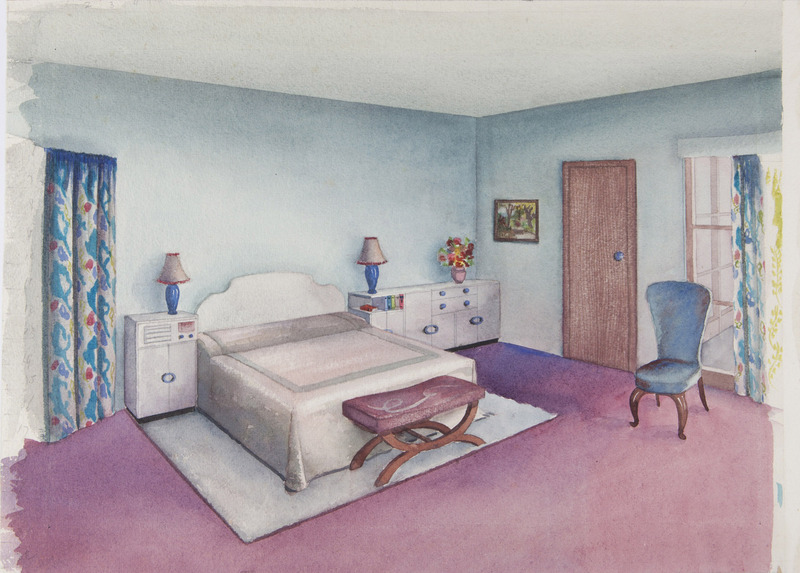 Watercolour design by East Sydney Technical College student Helen Burgess.